An anyonic exclusion statistics, which generalizes the Bose-Einstein and Fermi-Dirac statistics of bosons and fermions, was proposed by Haldane . When fusion of anyons is involved, certain ‘pseudo-species’ anyons appear in the exotic statistical weights of non-Abelian anyon systems; however, the meaning and significance of pseudo-species remains an open problem. The relevant past studies had considered only anyon systems without any physical boundary but boundaries often appear in real-life materials. In this paper, we propose an extended anyonic exclusion statistics on surfaces with gapped boundaries, introducing mutual exclusion statistics between anyons as well as the boundary components. Motivated by refs. [2, 3], we present a formula for the statistical weight of many-anyon states obeying the proposed statistics. Taking the (doubled) Fibonacci topological order as an example, we develop a systematic basis construction for non-Abelian anyons on any Riemann surfaces with gapped boundaries. The basis construction offers a standard way to read off a canonical set of statistics parameters and hence write down the extended statistical weight of the anyon system being studied. The basis construction reveals the meaning of pseudo-species. A pseudo-species has different ‘excitation’ modes, each corresponding to an anyon species. The ‘excitation’ modes of pseudo-species corresponds to good quantum numbers of subsystems of a non-Abelian anyon system. This is important because often (e.g., in topological quantum computing) we may be concerned about only the entanglement between such subsystems. M. Freedman, A.Y. Kitaev, J. Preskill and Z. Wang, Topological Quantum Computation, Bull. Am. Math. Soc. 40 (2003) 31 [quant-ph/0101025]. S. Guruswamy and K. Schoutens, NonAbelian exclusion statistics, Nucl. Phys. B 556 (1999) 530 [cond-mat/9903045] [INSPIRE]. C.K. Kim, A. Rakhimov and J.H. 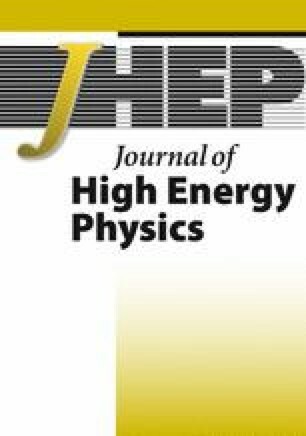 Yee, Ginzburg Landau theory of superconductivity at fractal dimensions, Phys. Rev. B 71 (2005) 024518 [cond-mat/0408630] [INSPIRE].